Vietnamese summer roll – roast chicken and herbs | Life's Conundrum - Eat to Live or Live to Eat? A couple of days back I cooked a roast chicken for lunch and had some left over in the fridge. I am hooked on cooking a whole chicken having successfully done so the last couple of times. The addition of fresh rosemary from the garden in both the chicken and vegetables makes it all the more tasty. Today’s lunch was fairly quick to prepare but it packed some flavour (fresh basil and mint from the garden). If you haven’t eaten a Vietnamese summer roll try it and you will give up the fried spring rolls. The summer roll started with the soaked rice paper layered with an iceberg lettuce leaf and filled with whole basil, mint and coriander leaves and a few chopped pieces of spring onion. I heated up the left over roast chicken for a couple of minutes with some Chinese crushed red chilli sauce. 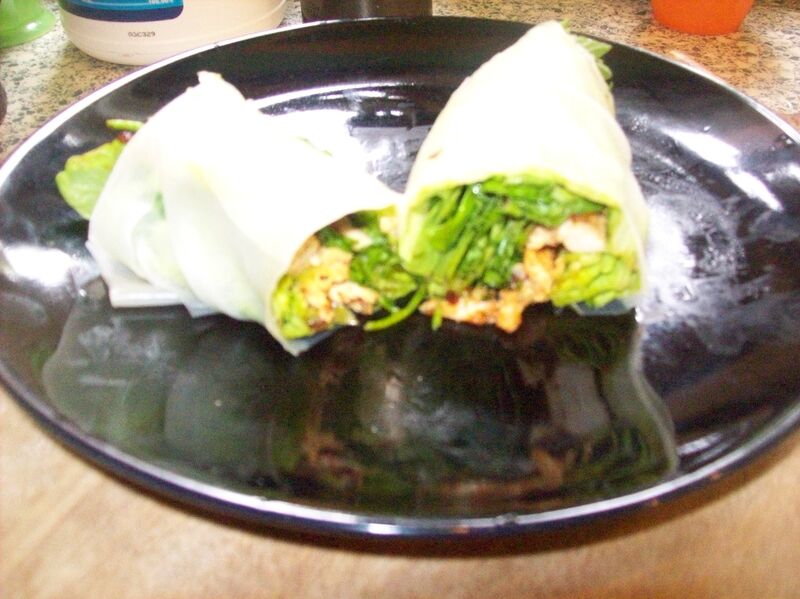 I added a good handful of the chicken on top of the herbs and wrapped the rice paper to form a roll. I can’t wait to get Anna to try this when she gets back next week as I am sure she will love the freshness of the dish. 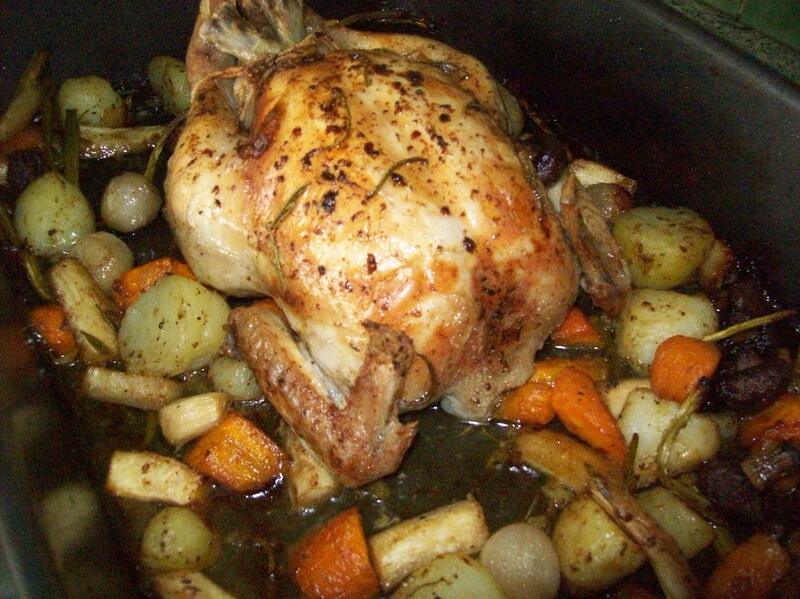 The roast chicken is simple to make. I used a small bird, cleaned it up, placed in a roasting pan and then seasoned with salt and pepper. I then rubbed the chicken with a generous knob of butter and placed a couple of knobs under the skin on either side above the breast. I placed a lemon cut in half and a couple of sprigs of fresh rosemary in the cavity and cooked in a pre heated 210 degree oven for an hour till chicken was cooked through. During the cooking process I take the pan out and baste the chicken with the melted butter to keep it moist. For the vegetable barring the potato (boiled and peeled it and added it to the roasting pan 15 minutes before chicken was done) I roughly chopped up some carrot, parsnip, celery and added some whole shallots, garlic cloves and button mushrooms – drizzled a little olive oil and seasoned them with salt, pepper and a few sprigs of fresh rosemary from the garden. I added the vegetables to the roasting pan half way through the cooking process. The end results was a nice golden bird with roasted vegetables. Posted on July 31, 2013 by Anna and Shiv	• This entry was posted in General banter, Main courses, Quick meals, Recipes and tagged Chicken, Cook, Home, Lettuce, Meat, Poultry, Rice paper, Roasting. Bookmark the permalink.